Between 1820 and 1860, the visual map of the United States was transformed by unprecedented urbanization and rapid territorial expansion. These changes mutually fueled the Second Industrial Revolution which peaked between 1870 and 1914. Between the annexation of Texas (1845), the British retreat from Oregon country, and The Treaty of Guadalupe-Hidalgo (1848) which cemented Mexican cession of the Southwest to the United States, territorial expansion exponentially rewrote the competing visions free-soilers, European immigrants, industrial capitalists, and Native Americans held for the future of the American Empire. The need for massive industry was obvious: in order to reach California’s burgeoning port cities like San Francisco and to expedite the extraction of gold from the mines, railroad tracks would need to be laid across the plains to reach the Pacific and open up trade networks. Questions abounded about the character this new American territory would take: would it be reliant on slave labor and fulfill Jefferson’s original vision of an agrarian republic? Would corporations or the federal government lay down the required infrastructure to ‘tame the West’? Still, others wondered if turning over the bison laden Plains to New York based corporations would stifle the American dream for America’s second and third sons. Still, others believed the technological innovations of the Second Industrial Revolution was the unstoppable culmination of modern civilization propelling the fulfillment of Manifest Destiny. Questions of this nature were not new in American history. Throughout the first half of the nineteenth century, Americans were forced to adjust to the implications of the First Industrial Revolution. 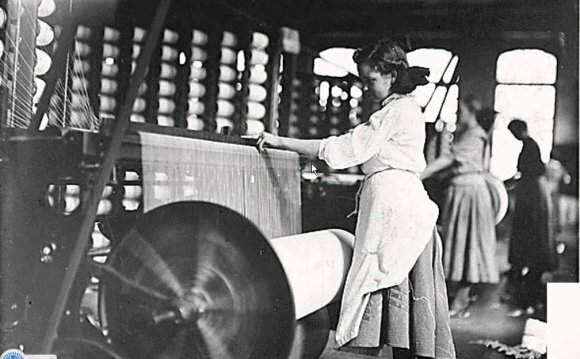 1750 to 1850 marked a century of heightened industrial activity centered around textiles. After the invention of steam power and the cotton gin by Eli Whitney in 1793, cotton could be shipped from the American South by New England ships to the vast textile factories of Great Britain, producing a reverse triangle trade around a single global commodity. These developments were hailed by some as “progress, ” but the pace, scale, and reliance of slave labor on these developments instilled in others a great sense of anxiety and fear. Although the economic and social problems of the first Industrial Revolution distressed many, these concerns were set aside during the nation’s bloody Civil War (1861-1865). In the aftermath of the Civil War and Reconstruction, the American economy grew considerably as it entered “The Second Industrial Revolution, ” generally recognized as the period between 1870 and 1914. The U.S. was awash in an abundance of natural resources from its newly acquired territories, a growing supply of labor immigrating from Europe, and the migration of emancipated African Americans North and West, an expanding market for manufactured goods, and the availability of capital for investment.